This week we discussed many topics related to the human body: body parts, caring for ourselves, problems with the body, body language, etcetera. Learners can try some dialogues about some body ailments or about how some people go to extremes to lose weight. Click the red button to listen. Learners can read a poem about body parts or anarticle about how tall are you. For original version, you can read about cosmetic surgery: Plastic but Not Fantastic. Now write a description about when you wake up and what you do with your body throughout the day. Be descriptive with body part vocabulary and body movement verbs. This week we talked about stereotypes and prejudice as applied to people from different countries, and of different race, age, gender, sexual orientation etcetera. You can review with a video about grammar and vocab related to prejudice. Learners can try a clip about national stereotypes. For original version, I recommend watching the documentary a Class Divided about how one teacher taught her students how to move past racism in the wake of MLK's assassination. Learners can read a text about prejudice, jealousy and short people. For original version, you can read about several news stories that tackle gender stereotyping or Zadie Smith's article You Are in Paradise. Choose one videoclip and describe it. Then give your opinion. Does it show stereotyping? Is it offensive? Why or why not? This week we reviewed the zero, first, and second conditional from our work last week and we moved on to the THIRD CONDITIONAL. You can review with a grammar video practice with some online interactive games including fling the teacher. Learners can try a video about a woman who describes some regrets about past mistakes. For original version, you can watch a clip from the movie Benjamin Button and write some sentences about how things could have been different. Or try listing to the TAL episode Regrets, I've had a few with transcript. Learners can read a text about a 40 year old man who has some regrets about his life. For original version, you can read about What if Nazi Germany had won WWII? Now is your chance to practice the beloved third conditional. Choose an event from your past. It could be a personal event or a historical event. Now imagine the possible consequences if that event hadn't happened. How would things have been different? First off, don't forget that this week is our extra activity! I will be giving a guided visit to my photography exhibit at Planta Baja (c/ Cigueña 10) onFriday April 8th at 19:00. Come join us! Now, back to work after the lovely break. 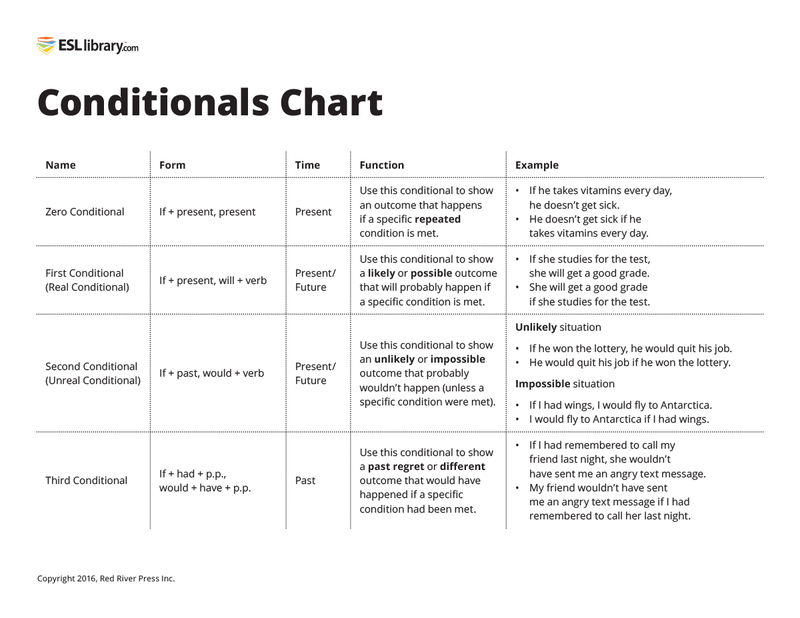 This week we started a two week session on Conditionals. Please check your knowledge of conditionals with this diagnostic quiz. We worked on the worked on the Zero Conditional, First Conditonal and Second Conditional. Next week is the third conditional! This week, learners can try A Perfect Day (a Second Conditional Excercise) or what you would bring on a desert island. For original version, try this short clip about What You Would Do to Change The World, or what would you take with you if you had to leave home suddenly. Learners can try the Billionairre Conditional Interactive Game or a reading comprehension activities with conditionals. For original version, read about what you would do if you actually won the lottery. Please write some text practicing the Zero, First and Second Conditionals. Zero Conditional: Please give some advice about common remedies for different ailments, e.g. If you have a cold, drink lots of liquids and get lots of rest. First Conditional: Imagine you have left your kids at grandma's for the week. Write your kids a note about what will happen if they behave or misbehave, e.g. If you behave all weekend, I will take you to the cinema next week. Second Conditional: What would you do if you had to leave your house to move to another country? What would you bring with you?